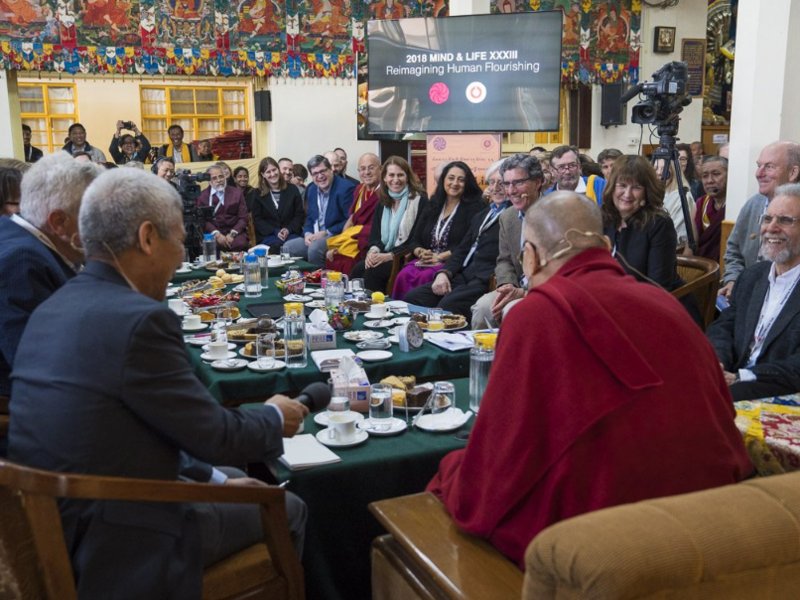 Earlier this month Amy Cohen Varela, Mind & Life Europe’s Chairperson, attended the latest Mind & Life Dialogues with His Holiness the Dalai Lama in India. She shares her experience in the following report. On Monday morning, March 12, the sun was brilliant and the air crisp as members of the Mind and Life community made their way up the path to the Tsuglagkhang, the Tibetan Temple by the Dalai Lama’s residence in Dharamsala, India. This was the first of five days of ‘Reimagining Human Flourishing’, the 33rd Mind and Life Dialogue. 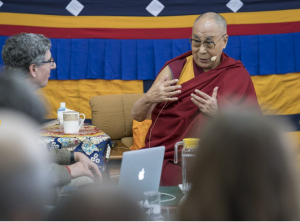 The program, co-chaired by Richard Davidson and Thupten Jinpa, was carefully designed to fully engage in dialogue western scientists and educators with Buddhist scientists and philosophers on a subject close to the Dalai Lama’s – and Mind and Life’s – heart: secular ethics and the education of young people. The scientific constructs of attention, meta-awareness and emotion regulation were examined in tandem with descriptions of concrete initiatives from educators dedicated to social-emotional and ethical learning and “education of the heart”. The Dalai Lama’s comments elucidated the Buddhist perspectives on questions such as the basic compassionate nature of humans, the nature and development of the “self”, and the problem of cultural materialism in education. He expanded the scope of the discussion with teachings on dependent arising, emptiness and altruism. It was with hearts full of gratitude that the Mind and Life community, after the final day of the Dialogue, wended its way down the path, and plunged back into the lively bustle of the streets of Dharamsala. All five days of the Dialogue are available for viewing.